Rediff.com's Archana Masih meets Prakash Raj, actor and Lok Sabha candidate in Bengaluru Central. 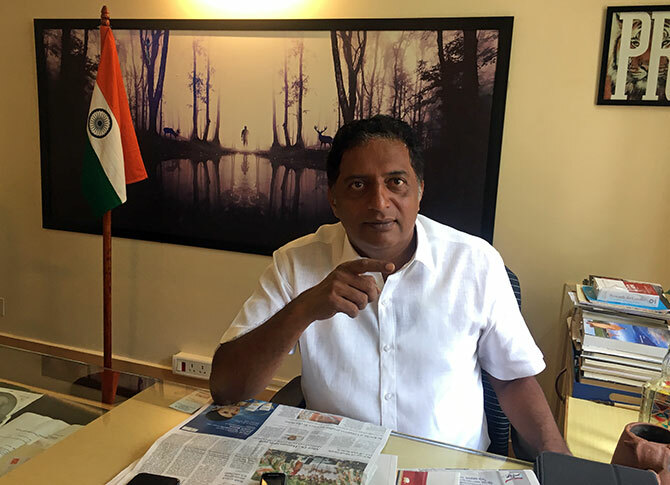 IMAGE: Actor and Independent candidate Prakash Raj in his office in Bengaluru. A framed Preamble of the Constitution and a statuette of Dr B R Ambedkar are placed at his desk. 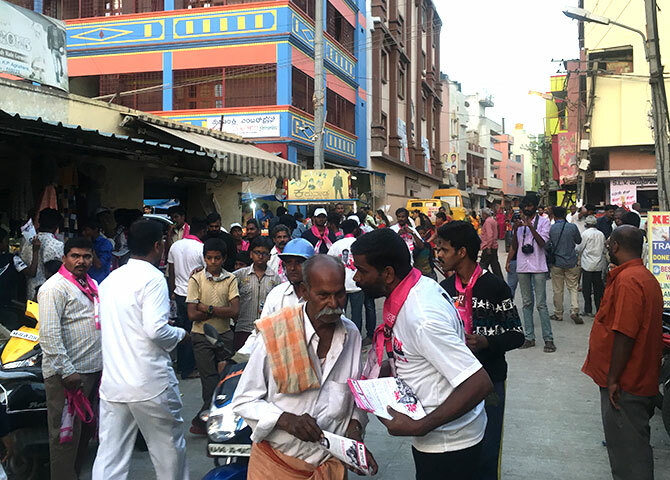 It's 5.30 in the evening and a crowd is awaiting actor and Lok Sabha candidate from Bengaluru Central, Prakash Raj, at a junction of small bylanes in a redeveloped slum in the city. People do their evening vegetable shopping, vendors sell gajras and small restaurants are readying tavas for kebabs and egg rolls. A man walks with a portable ampli-speaker from which emanates music interspersed with slogans for the candidate. There are no posters of the actor -- in fact the city does not feature a single political poster of any party. 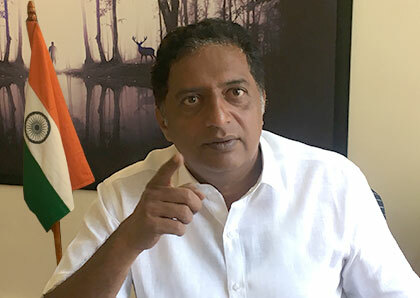 Prakash Raj, the successful actor with a string of films in all the five major film industries of the country, is coming for a padyatra through the area. Supporters are handing out pamphlets and pink sashes bearing the actor's face. Little boys run up and down blowing coloured whistles, which is the actor's party symbol. The shrill sound competes with the sound of drums being played by another group. All this being done under the watchful eyes of Election Commission observers whose vehicle is parked by the road. Prakash Raj's car comes up the narrow lane and as he steps out, fire crackers burst. 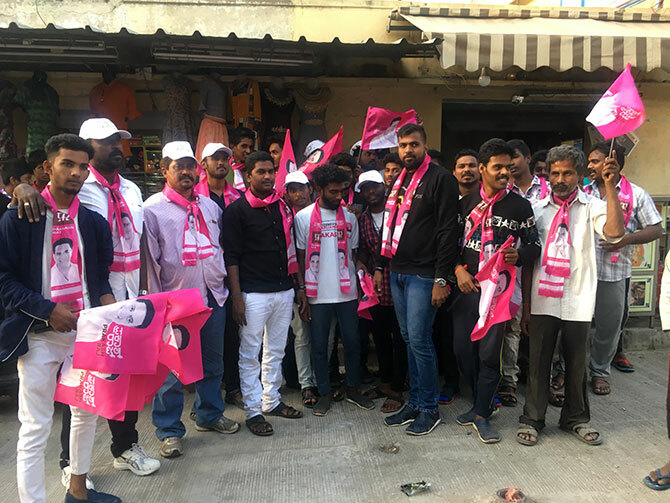 He greets people and without much ado, begins a brisk padyatra, raising his hands in a Namaste and is followed by a crowd. 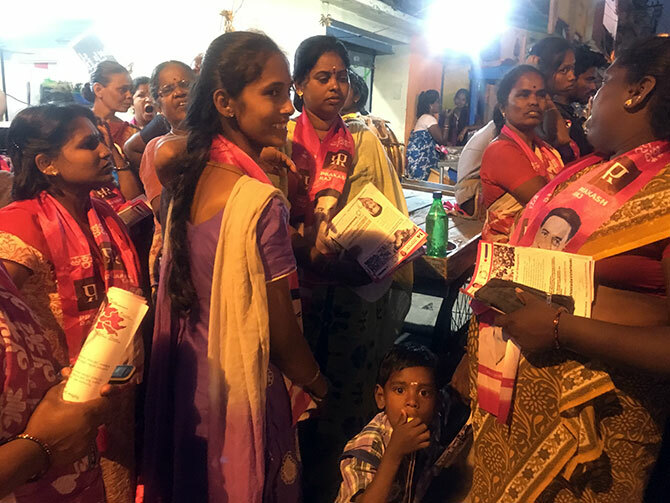 IMAGE: Women wear the pink stole bearing his picture and carry pamphlets as they wait for him in a marketplace. Next morning 8.30 am. The Prakash Raj Foundation office on Vittal Mallya Road. The actor-politician's home and office is opposite the fancy UB City mall, one of Bengaluru's most well-known addresses. Prakash Raj started out with Rs 120 in his pocket to get where he is today. The Foundation has adopted 3 villages in Karnataka, Telangana and Tamil Nadu and taken up 5 government schools. Next year it will include 30 schools. Pictures of Dr B R Ambedkar, Periyar, Gulzar, Girish Karnad, U R Ananthamurthy and many more Kannada literary figures line the walls. A map of Karnataka hangs on another wall, a framed Preamble of the Constitution is placed on the window beside his table. Prakash Raj arrives for the interview dot on time and will leave for the day's campaigning after the interaction. In a candid conversation with Rediff.com's Archana Masih, he speaks about his new journey -- from which he has no intention of turning back. IMAGE: As drums play, a group of men stand by the roadside await the actor. Francis Lobo, third left, is a friend for 40 years who manages the campaign locations. What propels your politics and what is your political ethos -- is it Socialist or Left of centre? I'm from the '70s generation, grown with JP's movement, know what Ambedkar, Kamaraj and Periyar have done for this country. Being in theatre exposed me to literature. What propels me today is how the spirit of democracy is no more. What disturbs me is how the two major national parties have done. I think we are in a denial mode in this country that they have failed to deliver. In the Constitution there is no idea of a political party. It is representatives of every constituency because it is so vibrant and varied. MPs represent 130 crore people, 90 crore votes and 544 seats. Do you see an MP behaving like a statesman? An MP is a world leader. S/he takes lakhs of votes and becomes one vote to a political party. What happened to the basic democratic spirit of electing your candidate, knowing your candidate, knowing that an election is a conversation between a candidate who is aspiring to represent and the people. Are we having that? What was the trigger for joining politics? This is another freedom struggle, we need representatives in Parliament, in the Opposition and government who keep a hawk's eye to see if every policy made is people friendly. Has it got a vision or is it for the survival of the party? Or is it appeasement politics? We have to see to that. Majoritarian is when a majority takes a decision. It is not dictatorship. It is about which issue is major. You need MPs who have a clear understanding of the reasons that have brought them to Parliament and have a vision. I have decided not to contest from any political party because we have to do the cleaning and remind people that we have to find our candidates. The common man does not elect the PM of this country. The local guy cannot get into politics because there is no atmosphere at all. ]There is an alarming state of thought process and that triggered me off. IMAGE: A man distributes pamphlets to passerby and autorickshaws. Even drops them through windows of mini buses. What according to you are the real issues today? We are forgetting that water, jobs, health, education are our problems. Everything is interconnected and that is the vision we need. Political parties don't understand what a job is. You have Mudra Yojana etc, but unless you understand what a job is you won't find policies. A job is a person's identity in a society, his way of living and his relevance in society. There are 1,000 odd jobs for railway clerks and lakhs including engineers are applying for it. So why aren't you reimagining the future? You need a vision. Today all crisis situations are being handled as an outpatient. You are trying to give first aid, it doesn't work like that. These were the triggers, but was the killing of your friend Gauri Lankesh the main reason for politics? I have been a politically conscious citizen. I've been an artist, a reader and have been chiselled by that. Gauri is not my election agenda. Gauri is something personal. What happened was very communal. The silencing of her voice has triggered me, it made helpless, made me feel guilty that if I was with her this would not have happened. The immediate reaction is I don't want another Gauri to happen but here let us not go back to it. This is about basic needs. There are 2,000 slums in Bangalore and those are the voters. A woman there is washing coke cans to fill water and is worried about thirst 3 years down the line. That is the issue and you are not worried about it and have 3,000 crore to build a statute! What was the impetus of speaking out against the PM? ...I don't have anything personal against him. I don't hate him, but as a citizen of this country, I am worried and when I ask, they are very comfortable in calling me an anti- national. Why am I anti-national? I questioned GST when 18% was levied on a handloom product. What happened to Swaraj? In two years you have changed it 200 times, you can't experiment with the nation. I ask his supporters that you are against black money -- are you paying booth workers and election agents in cheque? Have you really eradicated black money? Have you paid the price for speaking out against Narendra Modi? Are film-makers giving roles with the ardour they did before? How has politics affected your acting career? What does your family think? When I took this decision, I sat with my mother, wife, daughter, few industry friends. I started with Rs 120 in my pocket, I have 40 crores. I told them I have had enough. For the next 15 years, I am on a different journey, stand by me and they stood by me. 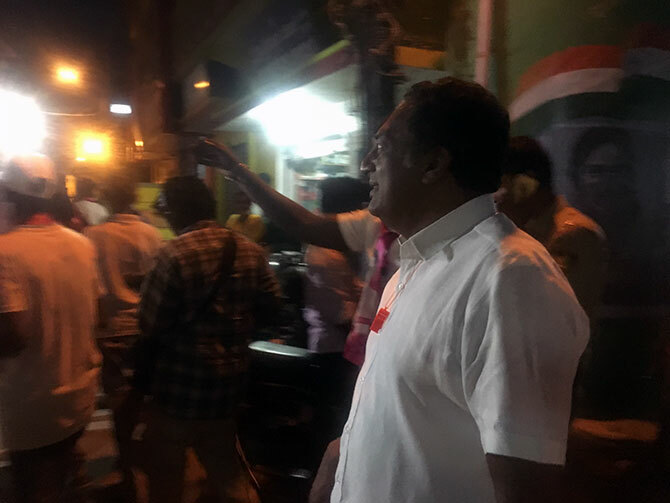 IMAGE: In the late evening, on an extremely hot day, Prakash Raj walks around the area, waving to locals. As an Independent trapped between the BJP and Congress, is your candidature tokenism? Yet, you threw in the dice which many feel is a courageous thing to do. Tokenism doesn't work. It is not only courageous, it is intelligent, relevant and right. The country is ready for alternative politics and disillusioned by political parties. You said I am trapped -- go to the grassroots, they are the ones trapped. I have not thrown in a dice, it is a way of life for me. One big leader said you might get 3 lakh votes and still lose. I said if I do, I will make sure you are sleepless because it will be me and three lakh people. It is not just about being an MP, but to empower. That is my journey and I am seeing an overwhelming response. Have you any idea what co actors like Paresh Rawal who are Modi supporters think about your candidature? I have no issues with Modi's supporters. You can take sides. I want to talk to people who can discuss issues wholeheartedly. It is okay to be on opposite sides. What is this language of ruling? What is an election? Is it a kabaddi match of winning and losing? If you elect the right government, people win, if you elect the wrong government, people lose. When you are elected to represent, deliver -- if you are not elected, make the MP deliver. Why do you think Bollywood stars went to meet Mr Modi? Do they genuinely believe in him or are pressurised in extending support? Are actors helping in your campaign? 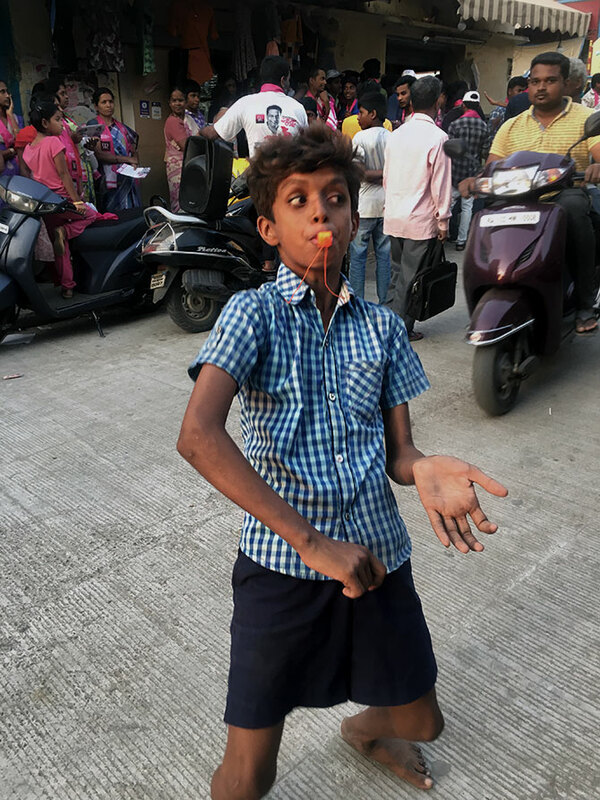 IMAGE: A young boy readily poses for a picture as he blows out of a plastic whistle, Prakash Raj's poll symbol. If you lose this election, will you continue on this political course? It is another horizon, another journey for me. I may do 1 or 2 films because I need to earn some bread money. I win, I deliver. I lose, I make the person who wins, deliver. MPs need to understand local, state and national issues. That's why look at candidates, see who speaks, see who delivers, see who is the voice, see who will differ on certain things. That is the spirit of the country. The people who are with me are not working for money. They have found an alternative. I started my journey alone, but I realised I will not be alone and I just had to take a step. Today I have more than 5,000 working on the ground. That is beautiful and means that they wanted a voice.